But he's not getting any yet! 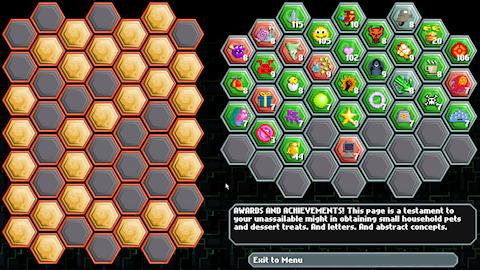 This is the Awards and Achievements screen in Robot Wants It All. The right side of it shows Awards, which I discussed a couple posts ago - you can earn those over and over. On the left side, we have Achievements, or rather we don't. Those are the blank spaces where achievements WILL go once there are achievements. It just randomly flips some of them to gold right now. But it is progress! Lots of juicy progress even! 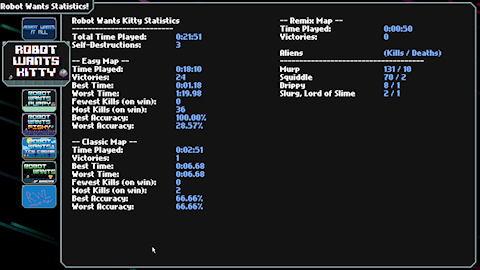 And then there's the Stats screen! This is just a big pile of detailed info about how you are doing in the game. It really serves no purpose at all, I just like to get lots of stats on the games I play, so I figured I'd give them to you too. Currently this is the only place you can ever find out what the names of the different aliens are. I'm not sure if we're going to do anything else there... I always think it's fun to have a Bestiary type of feature, but it's so pointless and silly (especially in a game where the monsters are just things I made up out of the blue, with no backstory or logic to them). Maybe. Anyway, beta testing should be getting underway in the next couple of days! Prepare for excitement!